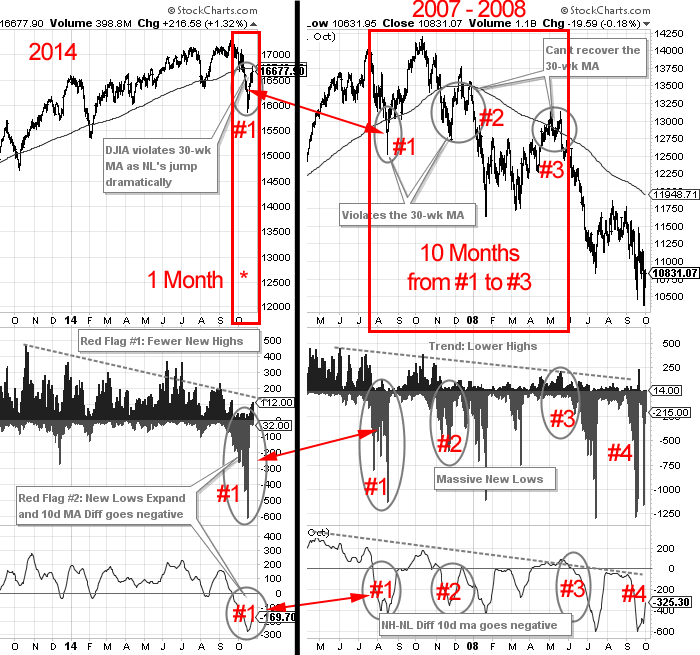 Market tops take time to form as the 2007-2008 graphic shows below. I developed the graphic due to several comments and inquiries following last week’s blog post titled “Calling a Market Top”. Several stocktwits and twitter readers decided to comment without reading the entire blog post or did not read it at all. They were quick to judge and throw out “bear” connotations based on the title of the post rather than digest the content. Today’s post further dives into the details and length of time the 2007-2008 market top actually took to form before fully breaking down (upwards of 10 full months). In contrast, the current market is barely a month into the first red flag, therefore, no one should be calling a definite market top – and I don’t believe anyone is, at least not around here. The most interesting aspect of the 2007-2008 market top is the fact the market made new highs, after the first red flag. 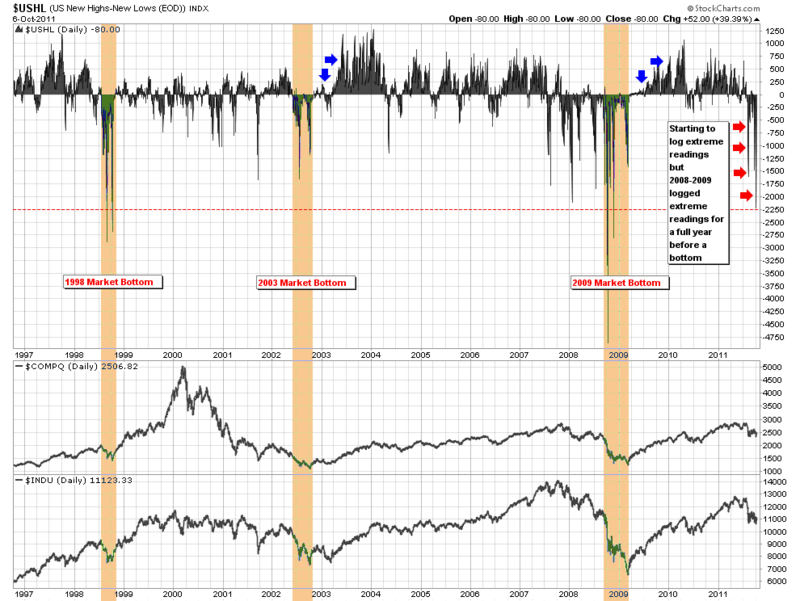 The NH-NL indicator also went back to positive territory after the initial negativity in July and August of 2007 (point #1 in the 2007-2008 side of the graphic). New Highs averaged 129 per day while new lows averaged 252 per day in August 2007. The indictor turned more positive following the summer as New Highs averaged 135 per day while new lows averaged 59 per day in September and October 2007. This was a complete up-tick in activity. However, December’s average was 56 NH’s and 292 NL’s per day and it only deteriorated from there. The point being, the NH-NL ratio can start to look more positive as an overall market top is forming. 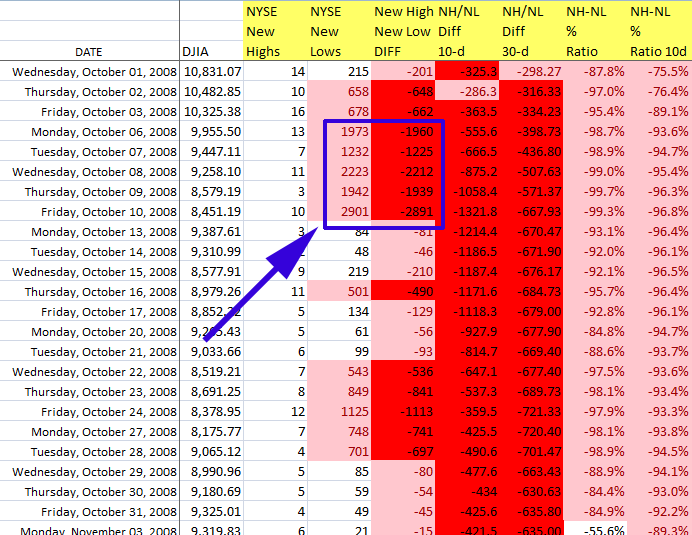 After the DJIA reached new highs in October 2007, the market took a big dive but made a higher low in late November 2007. However, the next red flag formed as the DJIA could not make higher highs and failed to recapture the 30-week MA (point #2). 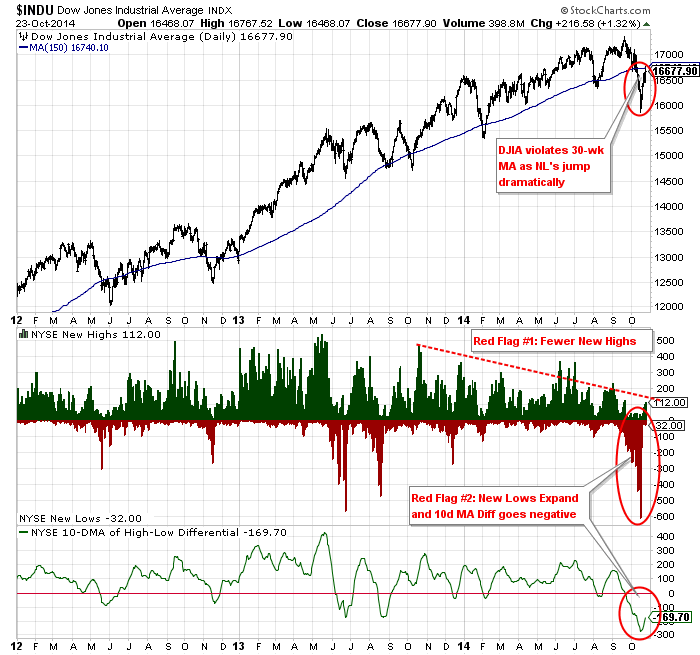 Another red flag was the fact the 30-week MA was starting to turn south (negative). 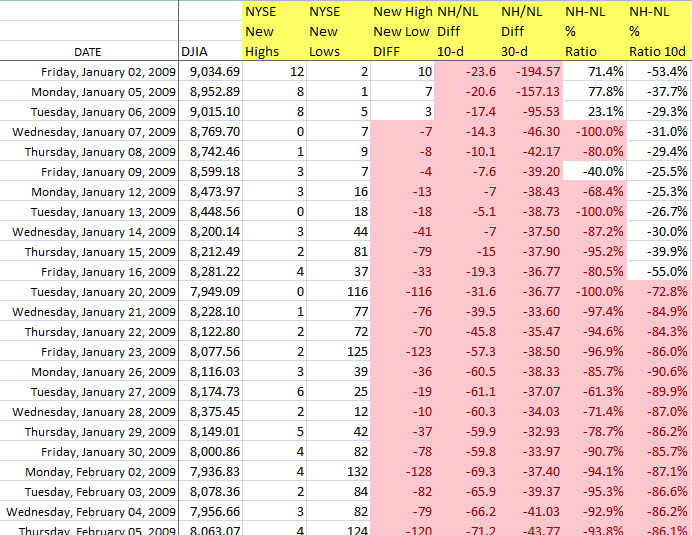 Following these red flags, NL’s accelerated and the market made an even bigger drop into January 2008. The final red flag took place between the months of April and June 2008, when the DJIA again failed to re-take the 30-week MA (as it was now trending downward) and fell well short of previous highs. 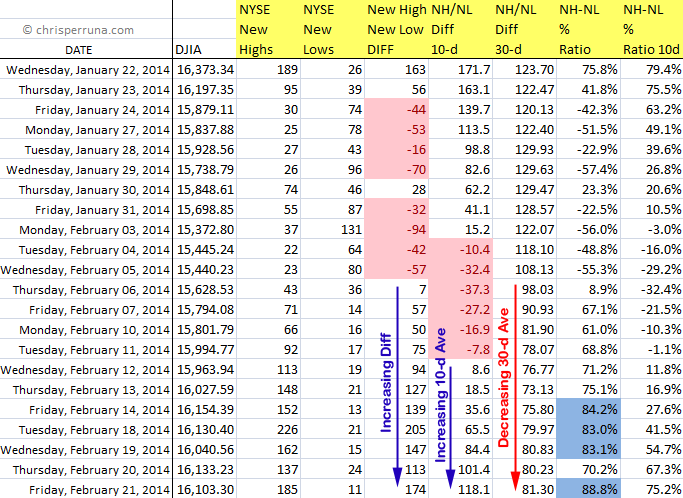 New Highs within individual stocks were drying up and NL’s were starting to accumulate again. This was the final break in the overall market top formation. The market dropped an additional 50% from here. Taking the analysis from above and incorporating it into today’s action, we can see that a market top (if one is beginning), is in its infancy and is likely to have several volatile swings up and down (both in terms of price and the NH-NL readings). A red flag is just a warning but it becomes a strong signal to take action when multiple warnings are registered. October 2014 is just a warning and I don’t know if it will lead to a more substantial correction but if it does, don’t be surprised to see higher highs before an ultimate breakdown. If it doesn’t, well, jump back in and ride the trend higher because circumstances are constantly changing when trading the market. No one truly knows what will happen next (and if they do – they’ll be a lot richer than I am when it’s all said and done). The rest of us can only play the odds and manage risk. My next post will focus on additional market tops so we can get a better feel for history, using charts. A long time favorite blogger of mine, Brett Steenbarger, Ph.D. (welcome back), of the blog Traderfeed wrote a post this weekend that inspired me to post my latest breadth figures. The Dr. notes that the NH-NL differential has been “waning” and that the breadth indicator may be reaching the top of a rangebound consolidation period for stocks. I don’t disagree but my findings are as such, based on the charts and data below. Starting with the raw data, we can see that the short term differential and 10-ma Diff are both increasing over the past couple of weeks. Now, they aren’t increasing with great strength but they are moving higher after a short lived “negative period” (highlighted by the pink cells for the Diff and 10-d ma). The longer term 30-d average never went negative during this period. In fact, the 30-d Diff average hasn’t been negative since September 19, 2013 which continues to tell me that the attempted corrections have not gained sustainable traction. Even back in September, the negative readings were short lived. 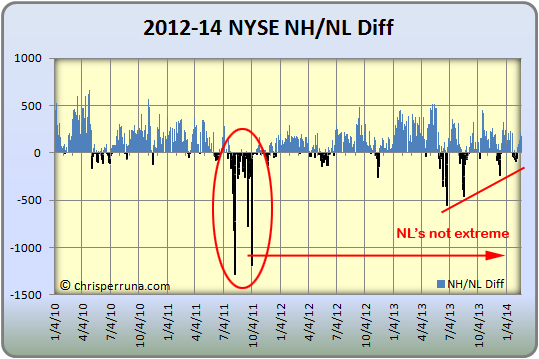 We haven’t had a TRUE sustainable correction, based on this NH-NL breadth indicator, since 2011. 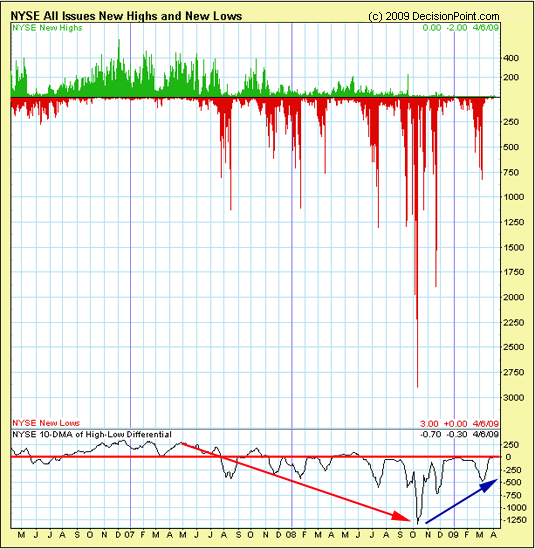 Looking at the basic New High – New Low daily differential chart, we can visually see that NL’s are nowhere near extreme levels and have been weakening since the 2013 peak set back in late June. Additionally, NH’s have also been weakening since their peak in May 2013. To the Dr.’s point, the breadth is also consolidating (similar to a triangle). But, there hasn’t been a major move to either end of the spectrum, positive or negative (the indicator has remained mostly neutral). 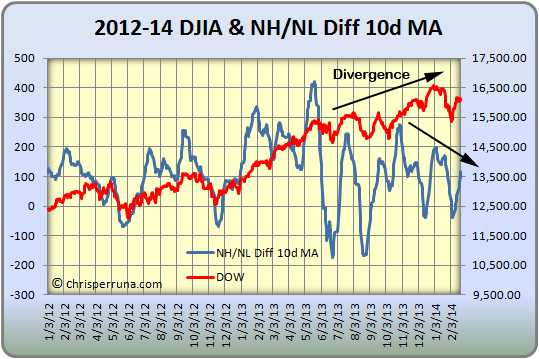 The next chart looks at the NH-NL Diff 10-d MA overlaid on a chart with the DJIA. The power of this chart shows the divergence of the DJIA making higher highs while the number of stocks making new highs vs. new lows decreasing. This resembles the chart the Dr. used in his blog post. Here’s where we can note a minor red flag. 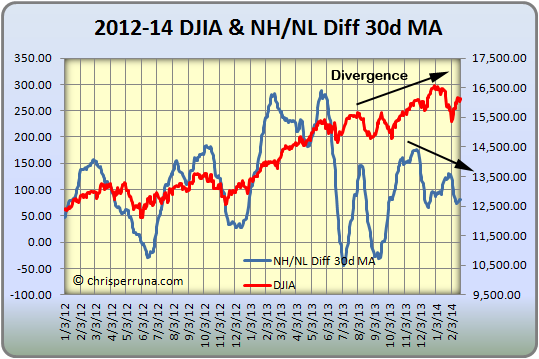 Similar to the chart above, the next chart shows the NH-NL Diff 30-d MA overlaid on a chart with the DJIA. The divergence is even more apparent with this chart and definitely raises a red flag for caution while aggressively trading going forward. It doesn’t mean to stop trading or investing as the NH-NL is still positive and the breadth indicator has yet to show a sustainable breakdown in nearly three years. Until multiple warning signs appear and the NH-NL goes negative for a sustained period of time (bringing with it the 10-d and 30-d Diffs), feel free to ride the trend by investing and/ or trading in the leading candidates. Can major market tops and bottoms be identified with accuracy? 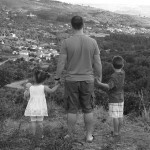 Yes, they can! And I will present data that will argue that identifying “major” market bottoms is easier than any other change in market direction. Market tops can also be identified but it’s a bit more difficult than bottoms. No one can guarantee an “exact top or bottom” but this data will pinpoint an overall change in trend. There’s plenty of time to get out of the market before a devastating fall and even more time to jump on a new up-trend after a bottom. 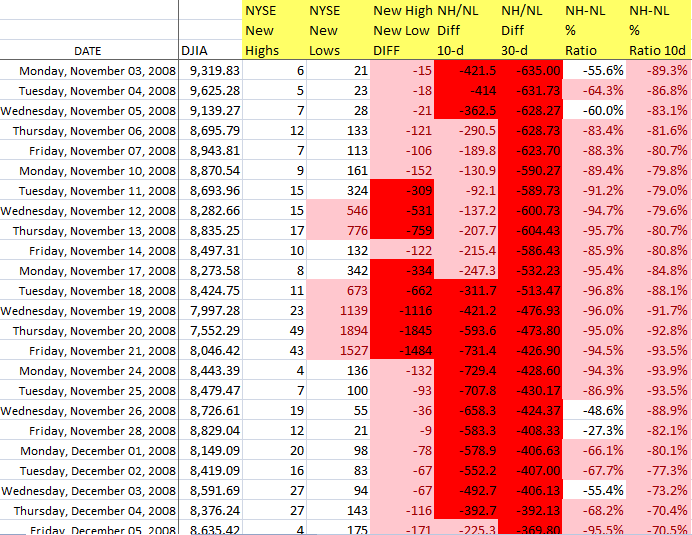 To support my findings, I will use extensive New High and New Low (NH-NL) data extracted from the NYSE in 2008 and 2009. This data phenomenon is not exclusive to the market bottom of 2009 as studies will show the exact, yes exact, same results can be extracted from every other major market bottom stretching back as far as the NH-NL data is available. New High – New Low data is historically the most accurate indicator for identifying a major change in trend by highlighting extreme readings and the change in underlying market breadth. 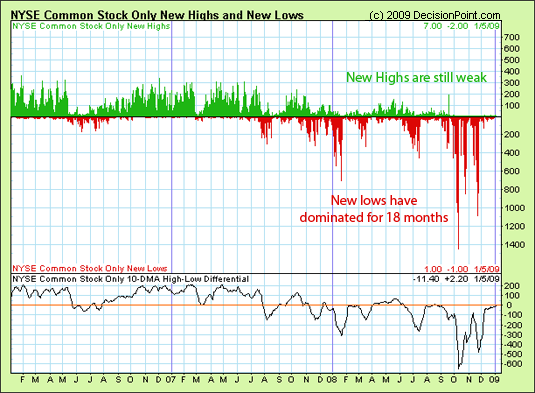 New High –New Low Differential: This is simply the number of stocks making new highs minus the number of stocks making new lows. NH-NL 10d Diff: This is a simple 10-day moving average representing the number of stocks making new highs minus the number of stocks making new lows. NH-NL 30d Diff: This is a simple 30-day moving average representing the number of stocks making new highs minus the number of stocks making new lows. I follow the progress of stocks making new highs and new lows on the NASDAQ and NYSE and pay specific attention to turning points in the differentials and ratios. I am particularly interested in the extreme highs and lows of the readings, especially after a long trend, as they start to drop hints of an impending change of trend (positive to negative and negative to positive). The image below shows that New Lows had dominated the market for nearly 18 months when extreme readings started to appear in October 2008. In fact, the readings in October 2008 were the most extreme that my NYSE NH-NL data contains which goes back to the early 1980’s. As the second image shows, the daily New Low readings were well above 1,000 with a peak of 2,901 on Friday, October 10, 2008. The market was screaming exhaustion as the selling pressure of the past 18 months was hitting its max. All other readings were in extreme territory including the basic NH-NL differential, the 10d & 30d differentials and the % ratio. The extreme readings continued through the end of November 2008 when they final subsided in December but remained negative. Heading into early 2009, “blood was running in the streets” as Baron Rothschild once declared and most investors had been knocked to their knees while two of the most prestigious investment banking firms in America disappeared. The greatest value investors of all time state that the best time to buy is when this type of extreme environment occurs. The problem with that statement is that it’s based purely on fundamentals and I just can’t blindly jump-in and grab shares without some form of technical guidance. Think about that for a second, blood had been running in the street for the duration of 2008 so I suspect that many value investors were buying and saw more pain before the market decided to turn. Buyers in early to mid 2008 had to endure quite a ride before the market turned up in the spring of 2009. I prefer to catch a trend on the up-swing, not the bottom; besides, pinpointing the exact bottom is virtually impossible. January 2009 was much like December 2008 as the market remained negative. 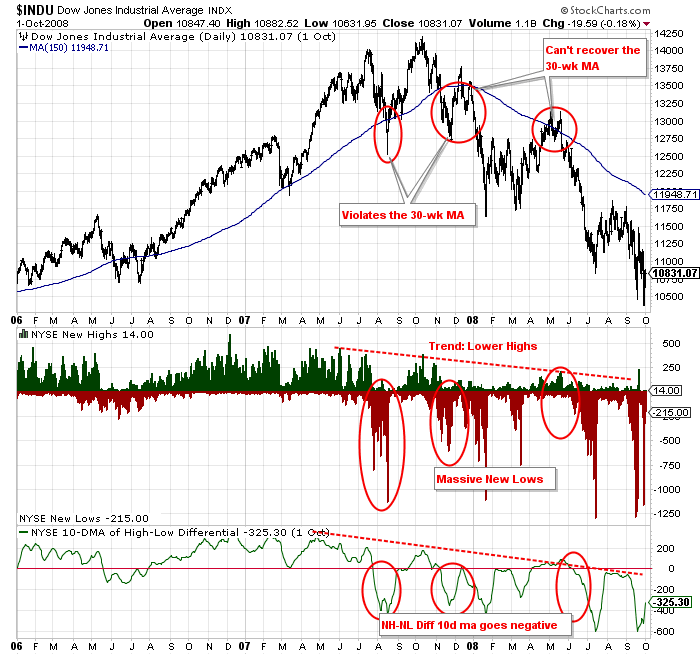 Then in February 2009, the market dropped again as the NH-NL readings started to head back towards more extreme levels. However, they didn’t reach the levels of October 2008 so this signified a “higher low” for the readings, a second clue that the market may be looking to reverse direction. March 2009 was the turning point. The extreme readings subsided (light red and dark red readings on my graphics) and the FIRST positive reading was registered since May 2008 (represented by “blue figures” on my graphics). 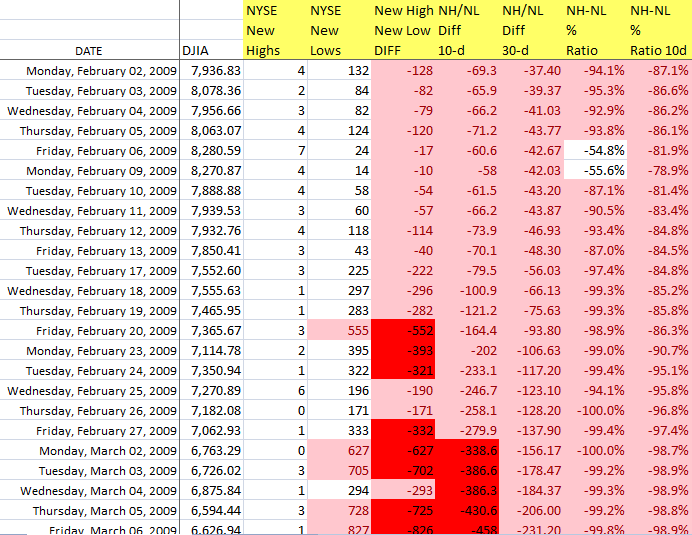 On March 26, 2008, the NYSE logged a reading of 10 New Highs and 0 New lows, the first time a “0” New Low reading was logged since February 27, 2004. 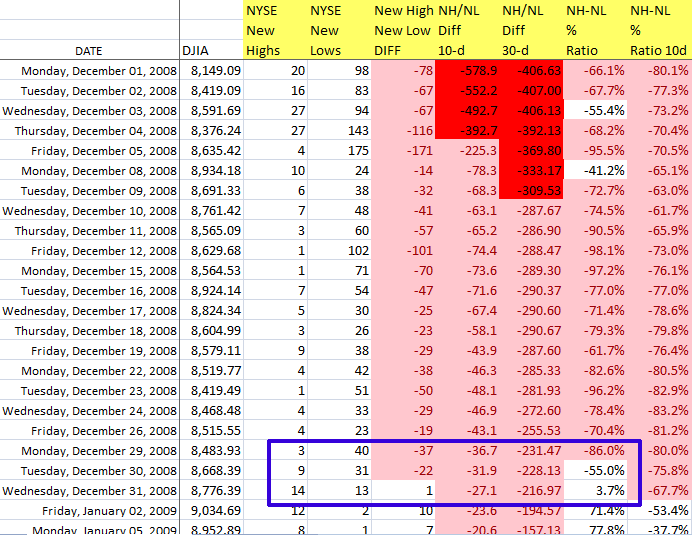 By contrast, the NYSE logged 11 additional days with “0” New Lows in 2009 and 20 days with “1” New Low for that same year. The year 2008 had one day with “1” New Low and the years 2005, 2006 and 2007 had zero days with “1” New Low. Amazing stats! The New High – New Low ratio (NH-NL) has been very accurate over the years when it comes to forecasting major and/ or pivital market lows. 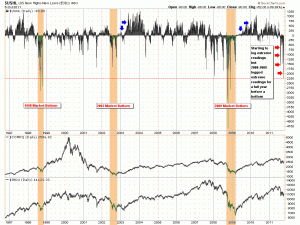 It typically logs extreme readings when the market is exhausted. That makes complete sense because most market participants have exhausted all the selling from their portfolios and holdings. I can’t confirm that the recent extreme readings of the past week are forecasting a market bottom until the NH-NL ratio turns positive again. The key, please pay attention, to these extreme readings is when it is followed up by the ratio venturing back into positive ground! See the blue arrow examples on the chart. 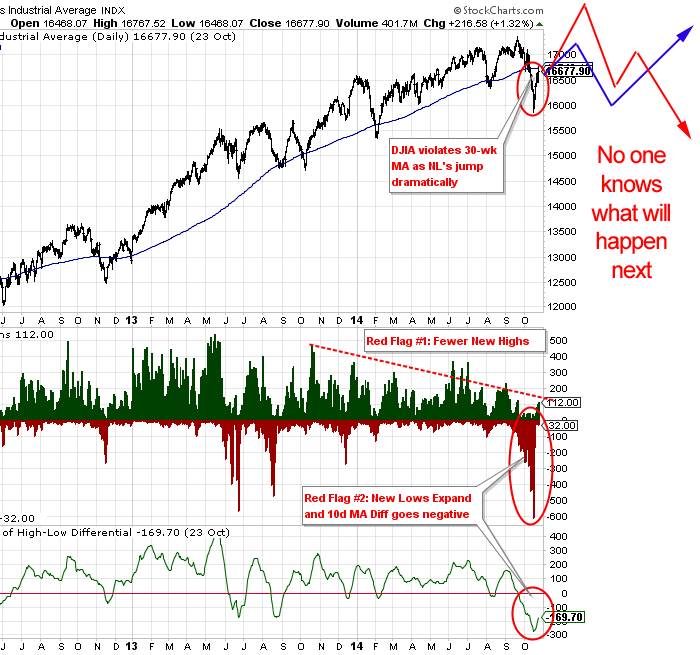 This confirmation signals a MAJOR market reversal. When that happens, that’s when the confirmation for loading up on equities is ringing loud and clear. But, you may ask, how do we jump in earlier than this confirmation because a good portion of the move is already underway when this finally takes place. Well, you look for a market reversal within one or more of the major market indexes along with a follow-through day, roughly 4 to 10 days later. A follow-through consists of a major index such as the $COMPQ, $DJIA or $SPX advancing 2% or more on volume larger than the previous day, preferably above average as well. When two or more major indexes follow-through, the signal to start initiating positions has arrived. 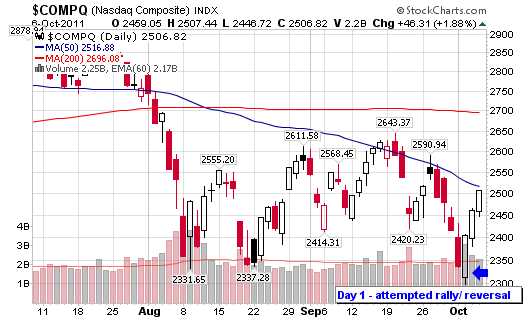 Tuesday was day 1 for the most recent “attempt” for a market reversal (even if it’s only short term). We now wait patiently before taking new positions for a follow-through day, beginning tomorrow (day 4). Stay tuned to see what happens. I am sitting in cash waiting for a signal.